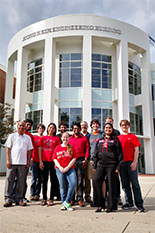 Three EIP students are part of a Wind Terpines team that received $20,000 in funding from the DOE and $9,000 from the UMD Sustainability Fund to develop a working prototype of an off-grid wind turbine. Comprised of both engineering and business students, the Wind Terpines team is competing against top universities across the nation in the Department of Energy’s Collegiate Wind Competition. EIP juniors on the team include Andrew Dallas, Shriya Gupta, and Njeri Warrington, as well as senior Brandon Draper. EIP Director Jay Smith serves as a business advisor for the team, while Mtech Director Peter Sandborn is a technical advisor. In addition to the prototype, the team is creating a business plan describing how to implement and scale the product. The team is conducting market research and analyzing user requirements for the turbine, as well as researching industry best practices to incorporate into their prototype. This spring, the Wind Terpines team will travel to New Orleans, where they will present their results to industry panelists at the American Wind Energy Association conference.